Dyeworks is a new shop located in the NC Mall! This shop will allow you to duplicate selected NC wearable items with up to three different color variations. First, you need to purchase a Hue Brew Potion from the NC Mall for 125NC each. Once you have bought your potion and are ready to use it, place it in your inventory along with the original wearable item you would like to dye. Then go to Dyeworks in the NC Mall. There, you will find all the selected NC wearable items you can use the potion on. Click on the item you'd like to dye. You must already own these items, in order to use the Hue Brew Potion on them. There are 3 selected dye colors for each wearable item. Once the potion is used on a wearable item, it will then duplicate to a random color. As long as you have a Hue Brew Potion and the original selected wearable item from the Dyeworks shop, you can dye the NC item as many times as you want. When this potion is used on a wearable item, you will still have the original item. Some of the NC items can be bought from the NC mall. Other items are from past NC events, and can be found from NC trading on the Neocash board. You cannot use Dyeworks items to dye other NC items. An item that has been dyed will have a name like: Dyeworks Blue: Shimmery Rose Top. The Hue Brew Potion does not require activation. Put the potion in your inventory, and then go to the Dyeworks shop. This potion can be used on your side-accounts, and can be gifted. The duplicated Dyeworks items can be also be gifted. You will need to use an NC gift box to transfer these items. For more information on NC gift boxes, check out our NC Trading Guide. 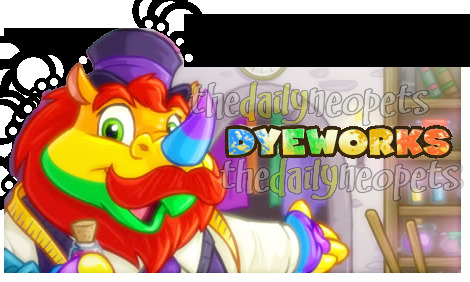 Several times since the release of Dyeworks, free potions have been given out to Neopians to use to dye their items. These events include the Altador Cup and Advent Calendar. 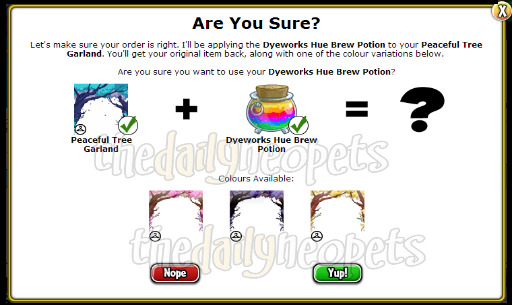 Dyeworks Hue Brew Potion This potion was awarded on July 2, 2014 from the Altador Cup Prize Shop. Dyeworks Holiday Hue Brew Potion This potion was awarded on December 21, 2014 from the Advent Calendar. Dyeworks Hue Brew Potion This potion was awarded on July 3, 2015 from the Altador Cup Prize Shop. Dyeworks Winter Hue Brew Potion This potion was awarded on December 19, 2015 from the Advent Calendar. Dyeworks Hue Brew Potion This potion was awarded on July 1, 2016 from the Altador Cup Prize Shop. Dyeworks Hue Brew Potion This potion was awarded on June 29, 2017 from the Altador Cup Prize Shop. Festive Dyeworks Hue Brew Potion This potion was awarded on December 16, 2018 from the Advent Calendar. The Snowager is awake. He'll be sleeping in 5 hours, 26 seconds.